This number does not accept individual campsite reservations; please reserve through Discover Camping. The public continue to access a closed trail with unfinished facilities, despite safety fencing and closure signs. Any public found inside the closed area or damaging public property will now face fines under the Park Act regulations, and immediate eviction from the park. Please be patient while we continue to address the rebuilding of this popular trail for the benefit of all. Spring run-off conditions and mudslides in the canyon have completely destroyed sections of this trail. Bridges have been torn from their footings and the river course has been re-routed in many sections. The trail and facilities will require an engineers assessment and estimate prior to any remedial work being completed, which will take place once current water levels begin to recede. There is a high likelihood that the trail will not be available for public use this season. Please be advised that we will post future updates as they become available. Herald Provincial Park is a popular destination campground and day-use area. The park covers 79 hectares of beautiful beach and forested uplands, and boasts a 128-site campground, boat launch and large day-use area. Swimming, fishing and bird-watching are popular activities, as is the self-guided nature walk to Margaret Falls. Just 14 kilometres from the Trans Canada Highway along the western shore of the Salmon Arm of Shuswap Lake, Herald is a great spot to use as a base camp for visiting the many attractions of the Shuswap area. Boat traffic is heavy on Shuswap Lake; swim only in designated areas. Theft is a recurring problem; lock all valuables in vehicles. Campsite reservations are accepted and campgrounds are 100% reservable. This park is located 14 km east of the Trans Canada Hwy. at Tappen, B.C. It is on the west shore of the Salmon Arm of Shuswap Lake. The closest communities, towns and cities are Tappen, Canoe, Sorrento and Salmon Arm. History: Established in 1975, this park was part of a farm owned from 1905 by Dr. Dundas and Edith Herald and their children. Canoes carried the first Europeans here, but by the 1870s paddle-wheelers frequently transported people between Kamloops and communities on the lake. The Canadian Pacific railway, and later an expanded road system, resulted in a much easier movement of people and goods. Starting in the 1950s, the increase of private cars brought a new industry to Shuswap Lake: summer recreation. Cultural Heritage: Contact the gate office for a copy of the in-park handout: it provides information for the self-guided nature trail, and about the human and natural history of this lovely place. Conservation: The canyon leading to Margaret Falls protects a unique ecosystem. Flowers, trees and shrubs are part of the park’s natural heritage, please don’t damage or remove them. Wildlife: Birders take note: 70 species are documented in Herald Park! Cougars, bears and other wildlife are seen on occasion – keep children close by when hiking. All water sports are popular on Shuswap Lake. Shuswap lake has 19 different species of fish and year-round fishing. The most popular fish are lake trout and rainbows to 10 kg dollies, Kokanee, burbot, whitefish. Trolling for deep lurkers is the most popular technique. Anyone fishing or angling in British Columbia must have an appropriate licence. Hikers will enjoy the two distinct topographical areas, upland and flat delta, which have created a great terrain for hiking. There is a trail to Upper Canyon, which has beautiful views of the lake. There are some rough sections along the 2.5 km trail. A self-guiding nature trail has interpretative stops to Margaret Falls. The brochure [PDF] or Campground Hosts (if available) can assist with area information. For your own safety and the preservation of the park, obey posted signs and keep to designated trails. Shortcutting trails destroys plant life and soil structure. There is an area set aside for petsbeginning below Reineker campground, extending to a portion of the Day Use Area. You are responsible for their control and behavior, and you must dispose of their excrement. Doggie bags are provided througout the park for your convenience. Pets/domestic animals must be on a leash at all times and are not allowed in park buildings or beach areas except for the area set aside above. Backcountry areas are not suitable for dogs or other pets due to wildlife issues and the potential for problems with bears. Scuba diving does occur in Shuswap Lake. Please check with local dive operators for more information. There is a large swimming area that is buoyed off from motor-boat use. There are no lifeguards on duty at provincial parks. Watersking is allowed on Shuswap Lake. Please check with the Canadian Coast Guard for the current regulations and restrictions. Windsurfing is allowed on Shuswap Lake. Please check with the Canadian Coast Guard for the current regulations and restrictions. There is a concrete boat launch available at this park. It is located in the day-use area of the park. A large parking area is available for parking vehicles and boat trailers. Overnight parking is not permitted. Please check with the Canadian Coast Guard or read information signs at launch area for current regulations on Shuswap Lake. Houseboats are not permitted to park overnight at this park, please refer to the Shuswap Marine Park web pages for information about lake sites. While campfires are allowed and campfire rings are provided at each campsite, we encourage visitors to conserve wood and protect the environment by minimizing the use of fire and using campstoves instead. Firewood can be purchased in the park or you may bring your own wood. Fees for firewood are set locally and may vary from park to park. Limited burning hours or campfire bans may be implemented. To preserve vegetation and ground cover, please don’t gather firewood from the area around your campsite or elsewhere in the park (this is a ticketable offence under the Park Act). Dead wood is an important habitat element for many plants and animals and it adds organic matter to the soil. Campfires must not exceed half a metre in height. Keep fires small, save trees and conserve firewood. Do not leave your campfire unattended. This is a high-risk forest fire area. Cold water taps are located throughout the park. Taps are shut off during the off-season. There are no hookups in this park. Water for filling holding tanks is available at the sani-station. This park has a large day-use/picnic area. It has a combination of grassy areas with over 1,000 metres of mostly sandy beach. There are both pit toilets and water provided. The day-use entrance gate is locked between 10 pm and 7 am. The gate is left open during off-season until snow stops access, at which time self-contained units are allowed to camp in day-use area. 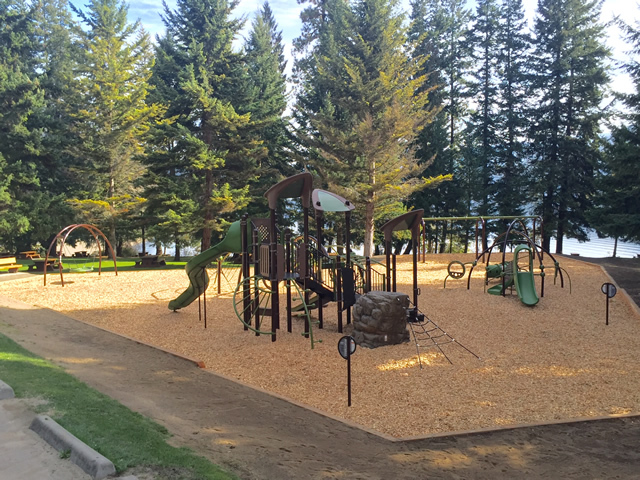 A new adventure playground was installed in the day-use area as part of the 2016 Capital Project. There are hot showers at this park. This park offers vehicle accessible campsites of which 26 are in 13 double sites. There are no pull through sites and all vehicles must fit into the gravel portions of the campsite, as there is no parking available for extra vehicles. The gatehouse is located at the entrance of the campground. The entrance gate is locked between 11 pm and 7 am. There is a self-registration station located near the gatehouse if the gatehouse is closed. Herald Park is a haven for recreationalists from May through October, dependant on weather. Campsite reservations are accepted and campgrounds are 100% reservable from May 1 to September 18. For your convenience there are two pay phones in the park; one is located at the entrance and the other is behind sites 113 and 114. Some of the facilities and hiking trails in the park are wheelchair accessible. Please talk to the on-site staff for more information upon arrival.